The first of the big wall quilts is up! The clock in the corner and a couple of pictures still need to be mounted on the walls, but the living room is almost done. 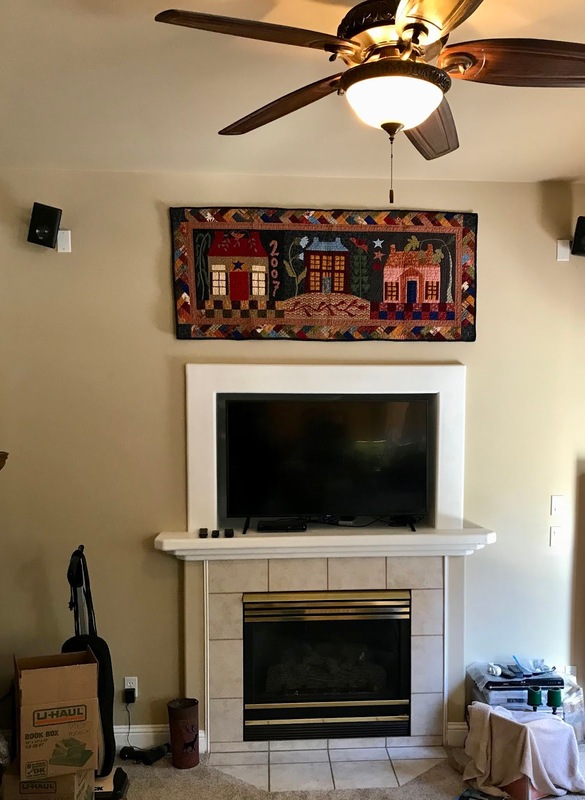 The mantle quilt is up, too, although the rest of the family room isn't ready for prime time yet. That will take a while, especially because the rail that keeps people from falling over into the family room still needs to be reinstalled. (They took it out to put down hardwood flooring, which is now showing a lot of wear, and never put it back. Not to code!) We have the rail propped up with boxes on one side, and a table on the other. 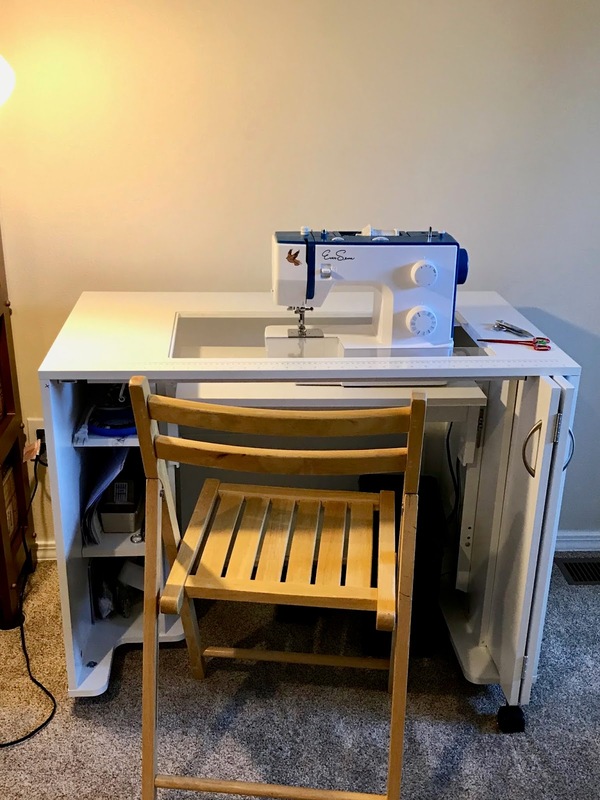 You may remember we had some trouble with the Arrow Mod Sewing Cabinet. Someone from the company talked us through making the corrections, and we were able to find a YouTube video that described how to make the airlift go up and down. (It turns out, they were serious about using WD-40 on all the moving parts.) The link they had on the website for adjusting the airlift to the right height for my machine went to the same video for the other kind of cabinet, but I found the correct video on YouTube and sent them an email with the corrected link. We also had trouble getting the doors to slide into the slot provided for them. That was partly due to the thick carpeting, but also the door hinges needed some adjustment. I used my lovely Eversewn Sparrow15 sewing machine to sew a couple of sleeves (split in the middle) under the binding of the Pine Burr quilt and will do the same for the others. Here's how I did it: I removed the hand stitching on the back of the binding of the side I wanted to go on top. I cut two rectangles out of some inexpensive muslin, 8" X half the width of the quilt, left the selvedge edge but hemmed the raw-edge ends under. Then I folded each strip in half lengthwise to form a 4" deep sleeve, and pressed. I pinned them to the back of the quilt with the raw edges even with the seam allowance of the binding, putting the pins in on the right side. Then I sewed over the same seam as for the binding with the right side up, as exactly as possible over the original stitching. Finally, I sewed the binding back in place by hand and sewed the bottom of the sleeve to the backing, also by hand. I'm using wooden battens for most of the quilts, although curtain rods will work just as well; they just stick out from the wall more. The wooden battens are 1/4" thick and 1 1/4" wide. The 8' length was fine for the 88" X 88" Pine Burr quilt for the living room. The battens will bend some, but when you place them flat against the wall, they will hold the quilt. I put a nail where I wanted the middle of the quilt to be, about where the bottom of the batten would be with the quit in place. 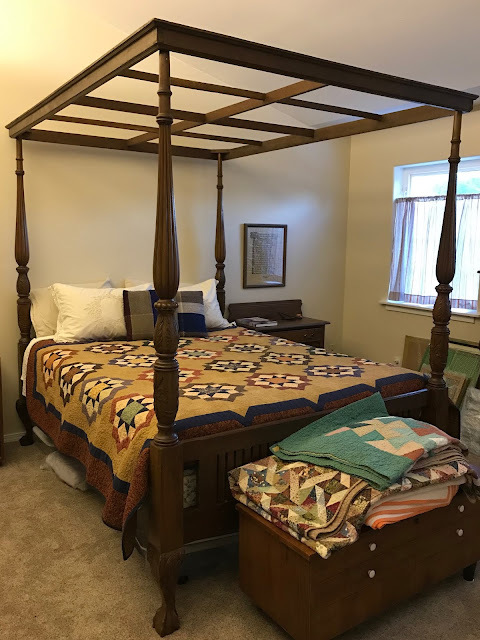 I measured the same distance down from the ceiling and put another nail the same distance from the ceiling, but half the width of the quilt away from the first nail. Then I repeated for the other side, so I had three nails, one 44" from the one on the left end and the other 88" from that nail. I put the space between the two sleeves, where the batten is exposed, on the middle nail, then flattened the batten against the wall and wrestled it onto the side nails, one at a time. I had to get up on a ladder to do this. Finally, I adjusted how much batten was sticking out on each side by pushing on the longer side while pulling the quilt and its sleeve toward myself. The other battens will have to be trimmed for the smaller quilts. I had to move my sewing table away from the wall a bit, to allow the quilt to hang over as I was sewing. I usually set up a folding tray table to the left of where I'm sitting, to hold the weight of the quilt. The folding tray tables are still buried in the garage, so I coped. I have plans to get a nice desk chair with no arms, so I can raise my seat a bit to accommodate my diminutive height. I will also need a plastic chair mat. I thought I had lost my bobbins for the Sparrow. We found them when I emptied the sewing table so DH would work on it. I finally settled on a prefinished, three-drawer kitchen base cabinet from Lowe's as a base for my cutting surface. 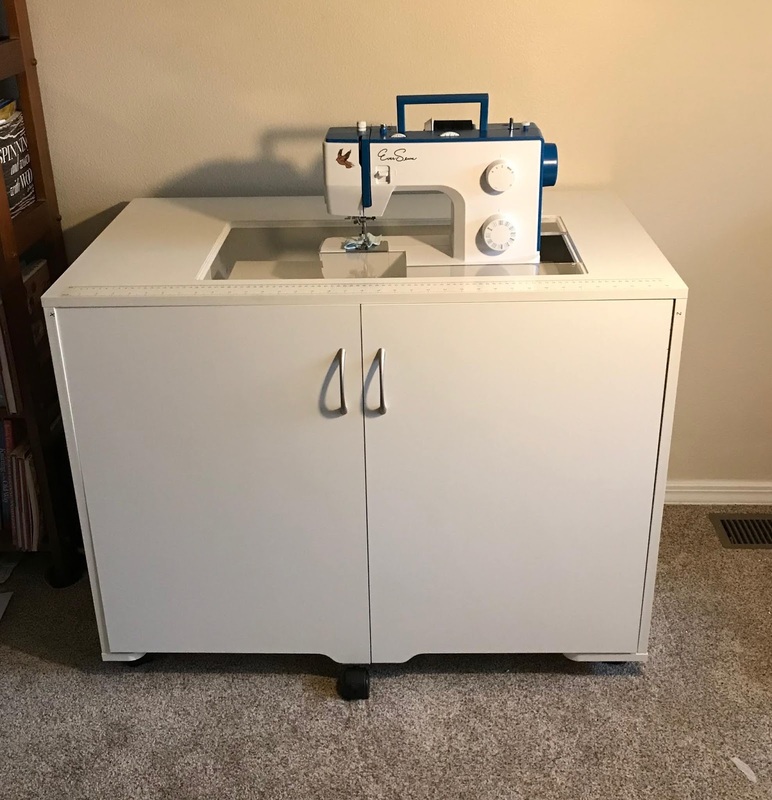 The top (brought with me from Utah) is 3/4" thick frosted plexiglas, so it doubles as a light table, with two under-cabinet lights upside down in the top drawer for light. The other two drawers will be good storage. It's 24" wide and just under 24" deep. It will be just under 36" high with the plexiglas top. I have a cutting mat that is 24" X 36", just the size of the top. The top will hang over on both sides, one side more than the other. I may have to put some kind of support under the end that hangs over more. There is a heater vent on that side of the room that limits where I can put it. Here's a photo from the website. I don't know how I'm going to deal with the toe kick. It was very expensive to buy a new toe kick, because it comes much longer than the size of the cabinet, and you have to buy the whole thing. I might be able to find someone with a small piece left over. If not, I may just leave it, unless I can think of a way to cover it up. The space at the bottom for the toe kick will come in handy, though. I have big feet. Thursday morning, I was in the mood to make oat bran cinnamon rolls, which pleased DH. We had a coupon for 10% off our entire purchase at Lowe's that would expire at midnight on Thursday, so late Thursday morning DH and I set out for the store to order, as they only had the 18" cabinets in stock. We wanted to buy the battens for the quilts, and DH wanted to get a large tarp to cover the trailer. We had to go through the appliance department, where his eye was caught by a dishwasher, and my eyes drifted longingly to the gas ranges. We had planned on replacing our kitchen appliances eventually. The dishwasher, which is very old and white, works well, but the way the racks are laid out, it won't hold many dishes. 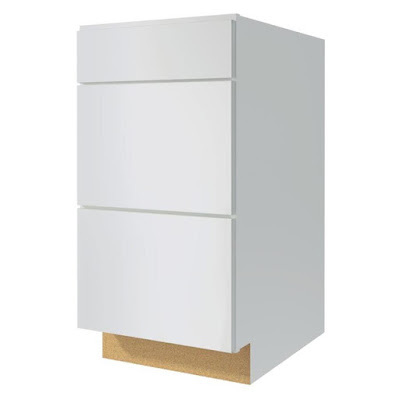 (I should say here that my preferred color for appliances is white, but these days white often means plastic handles and white appliances with a lot of useful features are hard to find. DH prefers stainless steel, which is a logical choice anyway, because the microwave over the stove is stainless.) The refrigerator we have is stainless steel, as is the free-standing range. The refrigerator has a broken foot and is missing a freezer shelf. The side-by-side layout makes digging around inside difficult, like looking through a brightly lit cave. Don't get me started on the stove! Well, since you ask, the oven works, but the temperature is unreliable. The burners work, but they have been cleaned so often the stove looks as if it had been given to Methuselah at his mother's baby shower. What I really dislike more than anything is the arrow-up or arrow-down way of setting the oven temperature. I like to keep food warm at 170º, and you have to stand there a long time before that temperature shows up on the display. I'd rather punch in the numbers. You probably can see where this is leading. Lowe's was having a big sale, and we learned that the 10% off coupon would apply to our entire order, even items on sale. We had to go home and measure the space allotted to each appliance. The refrigerator is the worst, because it's a skinny space, and there's no way to make it bigger without knocking out cabinets, granite countertop, etc. DH got to choose the fridge, because he had more requirements he considered essential. I chose the dishwasher and stove, because I suggested that he let me do that. This is what started our day and what we are ending up with. We learned from another customer in the store that getting service on appliances not made in the US requires bringing in someone from the other side of the mountains and is expensive. Local appliance-repair people can work on the US companies' products. 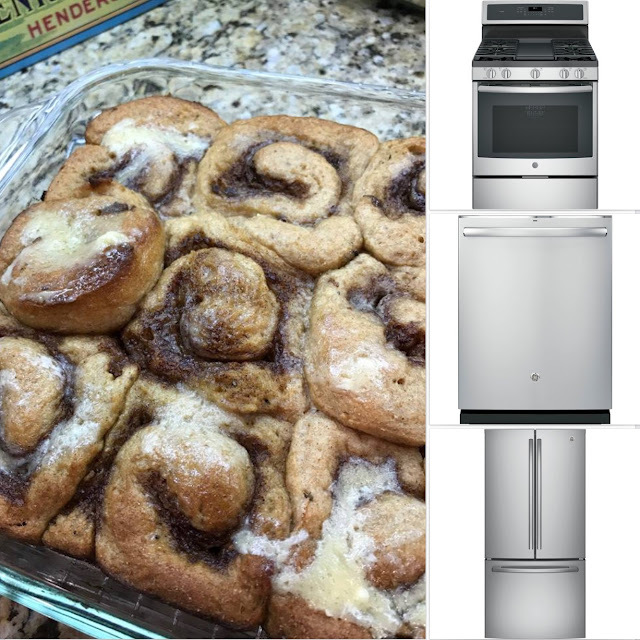 The GE had a skinny fridge (with ice maker down in the freezer section, where we don't need as much space) and a range and dishwasher with features I liked. Boom! Lowe's got a lot of money from us for one day, but we saved a bunch. The cabinet will be delivered to the store, probably sometime this week. I should be able to fit it in the back of the car. The appliances are supposed to arrive on December 20th. They will install the fridge (plug it in and hook up the water) for free, but were going to charge for hooking up the dishwasher and gas stove. DH will get his brother to help. I think I'll make those rolls again soon. Other things are getting done. In our home in Summit Park the ceiling in our bedroom was too low for the mosquito-netting frame, with the added complication of a much-needed ceiling fan. (We didn't have much of a mosquito problem in Utah and don't expect to have much of one here, but we do have the mosquito netting, which we brought back from Indonesia with the bed.) DH repaired the post that had been broken off by the movers, and after the glue had set, we wrestled the mosquito-netting frame onto the posts. We still have a lot to do in our bedroom and bathroom, but downstairs and our respective work areas are a priority. Saturday, someone came by and paid us $15 for Miss Havisham's (she of the Dickens novel) dust-catching chandelier. That brought the net cost of the replacement down to $35 with the Black Friday sale price. The young woman who came and bought it said it was for her sister who had her dining room decorated in French Provincial, and this would be perfect. She had sent her my photo of it. Not my taste, but I'm glad someone can use it. Miss Havisham's spider, evicted from the dusty relic, has found the new chandelier. If I can catch the little guy/gal, he/she will have to go live outside. I had finished the body of the Kisu Takki Cardigan for Jolena, so I finally CO Saturday for the sleeves. I'm doing them together, in the round, with steeks between them. That will require a seam, but I can match the stripes without a jog that way, and the cuff will be neater. Here's the body. There are cats at the top and fish swim around it at the bottom. The Doll's Storybook had a new episode on Friday, "You Are Special," where Billy explores the need for new purpose, now that he has rid himself of his girly clothes and hair. 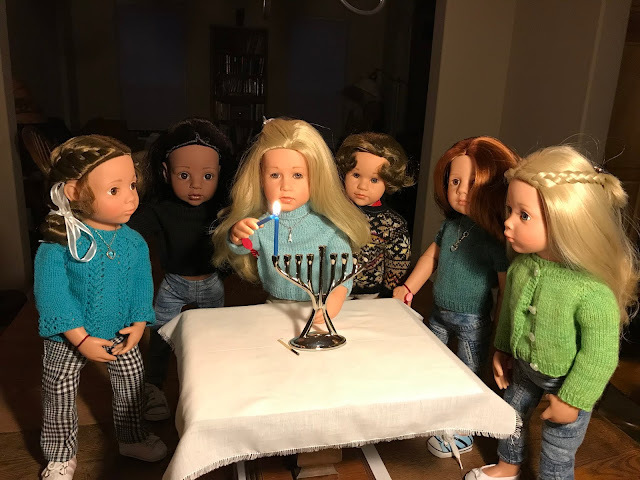 I started right away on the special Hanukkah story, where Charlotte shares her special holiday with her non-Jewish friends. I wanted to get our wonderful son-in-law to look it over for any errors or omissions I might have made. The story is intended to explain Hanukkah to children. Our daughter and her family celebrate both Hanukkah and Christmas. They will be here for Christmas. In related news, this is the view from our bedroom window. 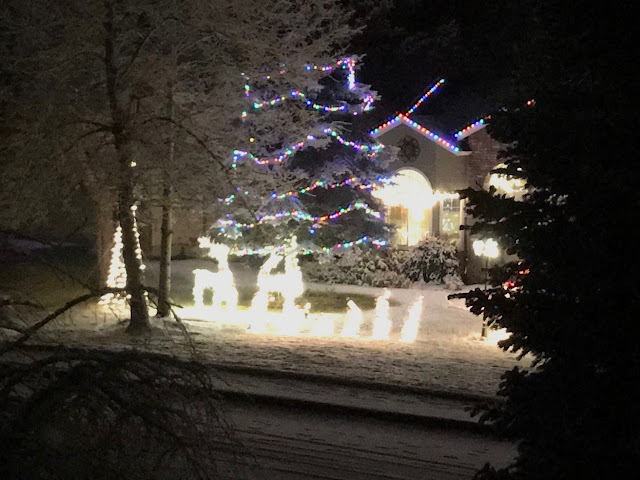 Our neighbors really like to decorate. The black silhouette to the right is our huge fir tree, undecorated, as it will probably have to remain. We would need a cherry picker to reach the top. What's on my needles: Back to the Kisu Takki Cardigan for Jolena, the same as the Stavanger, but with a different chart. 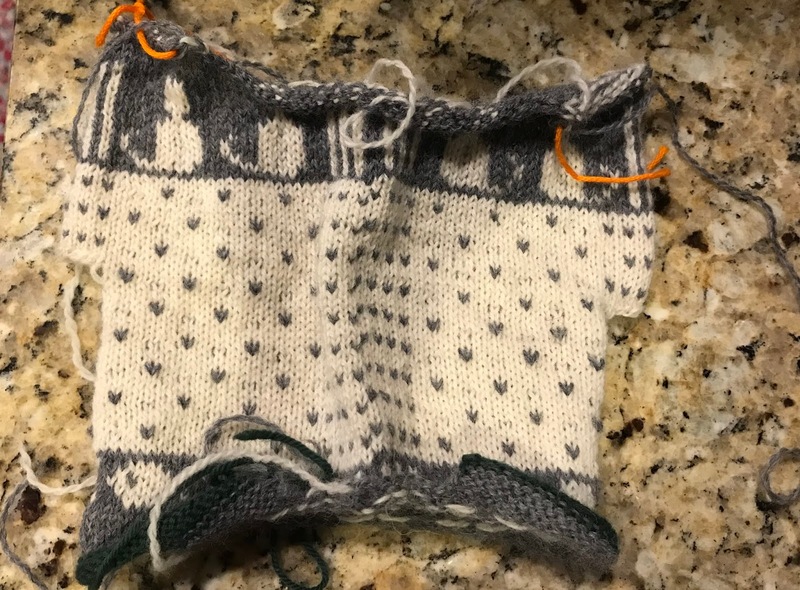 What's on my Sparrow 15: Sleeves for hanging quilts. What's in my hoop: Still the Spring Flowers quilt, no progress again this week. What's in The Doll's Storybook: You Are Special. This week's story will be about Hanukkah. Charlotte explains her rituals to the other dolls. What's on my iPad/iPhone: Still The Ladies of Ivy Cottage by Julie Klassen, but I've taken a break from it to listen to Rachel Maddow's Bag Man podcast, relating the history of how Spiro Agnew fell into disgrace and had to resign as vice president. I was around when this happened, but new details are only just now becoming available. What's in my wine glass: Black Box Premium Wines California Red Blend. It says on the box, "Stays fresh for six weeks after opening." We wouldn't know. It runs out long before that. What's my tip of the week: When you're making a quilt, if there is any chance you will ever hang it on the wall, a simple sleeve is easier to add as you put the binding on. You can use the same fabric as the backing, so it won't be obvious if you use it on the bed or as a lap quilt. Thanks, Irene. The fiber studio is more or less tidy now. I still need additional shelves in the closet, but I can open the doors without having everything fall out. I'll post photos in next week's blog post. Your home is shaping up nicely since your belongings have arrived. 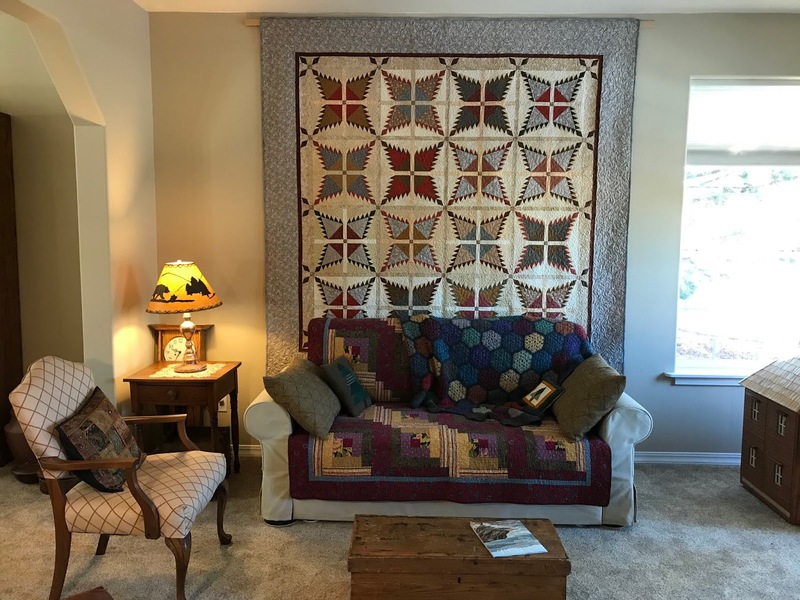 I love the wall quilt. It looks beautiful on that wall. You did great on getting your appliances on sale. Janet, I wear a sleep mask. DH stays up late, and we have night lights in the bathroom and the hall. The pups have been barking at The Three Wise Men across the street when the light hits them in the morning. They think people are standing in the neighbors' yard! Barbara, thanks, but I'm under pressure. The kids are coming for Christmas. Your big quilt looks perfect! You are making great progress and solving problems left and right. Take your time. Enjoy the process. Your house is coming along nicely Peggy. Love the new appliances too. I hope your neighbors' decorations don't keep you awake at night! Yes, Carol Ann, it has snowed twice now. There is still some on the ground. DH went skiing today with his brother. My sleeves are 4" minus the seam allowance, so 3 3/4". I don't plan to enter any quilts in quilt shows, but it's a great idea to sew the label on the sleeve while you're at it, instead of the back of the quilt, where it has to be done by hand. Everything looks like it is coming together at your new house. Has it snowed in Bend yet? We have about 6" new snow at the Mountain House (at 5,000 ft.) this week. We're expecting another cold storm on Wednesday. Loved your Tip of the Week this time. After learning the hard way, now I always put a sleeve on my quilts, even those I do not expect to hang. Ya' never know! It's much easier before you sew the binding on, as you mentioned, and using the backing fabric works very well if it ends up on a bed. Also, I make sure the sleeve is wide enough (3-1/2 to 4 inches), and has a permanent label sewn on he back, just in case I want to enter it in a quilt show. Some of the quilt hangers in shows are nearly broomsticks!